SuperGIS Web Mapper is a brand new feature in SuperGIS Server 10 that allows users to effortlessly build up a personalized web GIS application or save their current settings as templates for future use. Basically, SuperGIS Web Mapper is a standalone website, as you can see on its home page displaying the information about this application and providing several management tools. The building environment of Web Mapper is extremely intuitive and highly flexible that empowers users to customize a web GIS application without even a single line of code. Through Web Mapper, users can easily set up and adjust the overall appearance of web GIS apps, including the color, style, and layout. Furthermore, the title and subtitle are editable so that users can enter preferred name quickly. Even the logo and the color of header can be determined or uploaded in the “Layout page”. SuperGIS Web Mapper provides a simple way to overlay various online GIS services without writing a line of code. Users can determine what kinds of online maps or OGC (WMT and WMTS) services should be loaded as the basemap by checking a box. Besides, the procedure of adding SuperGIS Server published services becomes simpler. By clicking “Set Map” in Web Mapper, multiple services can be imported at once, saving you a lot of time spent on loading them through your codes. The widgets provided by Web Mapper can significantly augment the functionality of your web GIS app. SuperGIS Web Mapper enables users to configure the needed tools in a straightforward way. There are two types of tools- default tools and custom tools. The former are embedded in the map by default, including scale bar, coordinates, and index map. The latter include tools like basemap, bookmark, query, edit, draw…etc. But the best thing is no matter you are using the default tools, custom tools, or both; it is possible to switch any of them on or off when you change your mind. After completing the personalized Web GIS application, users can launch it immediately or save all settings for further use. 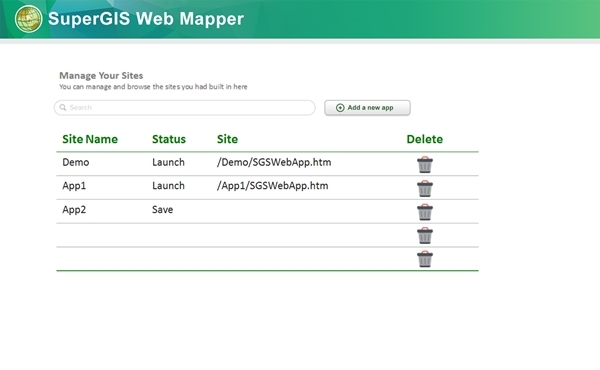 The status of launched app will be displayed on the home page of SuperGIS Web Mapper. For the apps that have been saved successfully, users can redesign them anytime.